Alibaba (BABA) is the new belle of the dot-com ball in China. The e-commerce juggernaut pulled off a record initial public offering in September when it raised $25 billion on the way to becoming a public company. Analysts love Alibaba. They were able to initiate coverage on Wednesday, following the 40-day quiet period that follows an IPO's debut. Only one of its underwriters -- Goldman Sachs -- failed to tap it as a buy recommendation. It's easy to see the appeal. Alibaba helped 231 million active buyers place 11.3 billion orders totaling $248 billion in transactions last year, and it's just getting started. However, the stock, with its nearly $250 billion market cap, isn't cheap. Let's look at some Chinese dot-coms that have been trading longer and could be more compelling bargains. China's leading search engine posted another blowout quarter on Wednesday, just as analysts were gushing all over Alibaba. The company behind China's largest search engine saw revenue soar 52 percent over the prior year's third quarter. Earnings climbed just 27 percent, but that was twice as fast as analysts were expecting. Baidu is investing in low-margin online specialties including travel, video and mobile app storefronts, and that weighs on bottom-line growth. 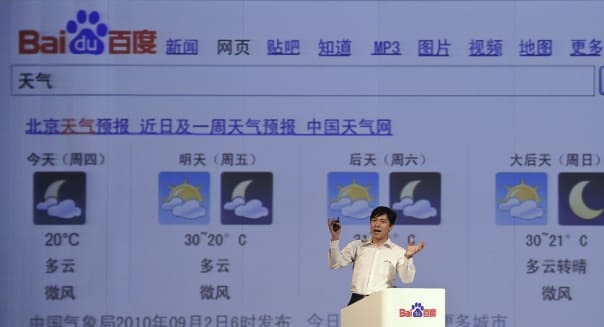 Baidu remains one of China's biggest winners. It went public nine years ago at a split-adjusted price of $2.70, and now it trades north of $200. Baidu fulfills roughly two-thirds of all queries, and it is rocking at a time when its profitability is still suppressed. Matching employees to potential hires started out with old-school tech for 51job. It got its start by inserting weekly job listings in more than two dozen leading Chinese newspapers. Then the Internet came along, allowing 51job to convert its thick Rolodex and respected brand into a leading online recruiter. It's working: 51job is growing its revenue in the low double digits. It's trading at a reasonable 22 times this year's projected earnings and less than 17 times next year's target. Despite soundly beating Wall Street income forecasts for three consecutive quarters, the stock is trading closer to its 52-week low than its high. That's an opportunity. Daily deals and flash sales have burned investors, as Groupon (GRPN) has been a market disappointment. LivingSocial hasn't been able to go public given the lukewarm investing appetite for flash-sales websites. It's different in China, where Vipshop has been one of its biggest success stories. Vipshop offers deals on apparel and other items that only stick around for a few days. The shares have more than doubled this year after more than quadrupling in 2013. The heady growth isn't over yet, with Wall Street pros modeling 115 percent in top-line growth this year. Online gaming stocks have become an investing minefield in the U.S. given the fickle nature of players, but China's been kinder to its leading franchises. NetEase is the company behind "Fantasy Westward Journey," an online game that has proven magnetic for several years. When Activision Blizzard (ATVI) wanted a partner in China to introduce "World of Warcraft" to the world's most populous nation, it chose NetEase, and the successful partnership finds NetEase working on introducing more Activision Blizzard games in China, including "Diablo III." NetEase isn't growing as quickly as it was in its prime, but it's still hitting low double-digit growth. It trades for just 15 times this year's earnings and 13 times next year's estimate. NetEase also pays out a quarterly dividend, something that's rare with Internet stocks. China is risky for investors, and Internet stocks are even riskier. The often-restrictive government is keeping a close eye on cyberspace, assessing the threats and opportunities that it brings to the country. China's stock market also marches to its own beat. It has soared during down years for the rest of the world, and last year the Shanghai Composite took a 7 percent hit when U.S. equity markets rallied. However, there are plenty of intriguing and reasonably priced companies out there. Alibaba is a great company, and it may even wind up being a great stock. However, there are other stocks benefiting from the same trend that don't have the hype of Alibaba baked into their prices. Motley Fool contributor Rick Munarriz has no position in any stocks mentioned. The Motley Fool recommends 51job, Activision Blizzard, Baidu and NetEase.com. The Motley Fool owns shares of Activision Blizzard and Baidu. Try any of our Foolish newsletter services free for 30 days. To read about our favorite high-yielding dividend stocks for any investor, check out our free report.